Richard has planned his first seminar of 2015. 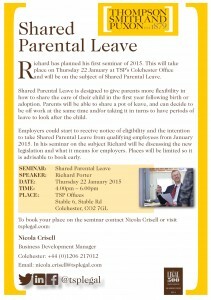 This will take place on Thursday 22 January at TSP’s Colchester Office and will be on the subject of Shared Parental Leave. Shared Parental Leave regulations are due to come into force on 1 December 2014 and the new rights will apply to parents, (who meet the eligibility criteria), where a baby is due to be born on or after 5 April 2015, or for children who are placed for adoption on or after that date. Shared Parental Leave is designed to give parents more flexibility in how to share the care of their child in the first year following birth or adoption. Parents will be able to share a pot of leave, and can decide to be off work at the same time and/or taking it in turns to have periods of leave to look after the child. Employers could start to receive notice of eligibility and the intention to take Shared Parental Leave from qualifying employees from January 2015. In his seminar on the subject Richard will be discussing the new legislation and what it means for employers. Places will be limited so it is advisable to book early.